The story of Moses provides several key principles on how to develop and maintain margin in our lives. Moses asked questions of God and God answered them. He carried too large of a load and God sent someone to advise him. He missed something important he should have done and again, God sent someone (his wife) to help him. God will help us work things out if we are serious and willing to make the needed changes. May the Lord strengthen and direct you as you begin to move to create margin in your life. The purpose of margin is to allow us to live life beyond ourselves. Life is a balance between the Clock - those things we have to do, and the Compass - those things we would like to achieve. If we take a moment to assess where we are in dealing with our busy lives, we may have to admit we haven't made any changes yet. This message provides some practical steps on how to change our treadmill routine so we can begin building margin into our lives. We live in a world that loves to tell us that lines don't matter - everything is fair and even. In reality, life has lines and limitations. If we play by certain rules, life will give us better results. We create life-giving margin in our lives when we color inside the lines of personal conviction as God intends. Based on God's guidance and truth, just because we can do something does not necessarily mean we should do it. Guest Speaker Marc Estes, Pastor of City Bible Church in Portland OR, shared that the "Busy" series is a "now" message to God's church and to each of us as individuals. Not only do we not have margin in our lives, we have lack in our lives. The devil is cunning and crafty - if he can't make you bad or distract you, he will make you busy. Margin is God's gift to allow us to live life beyond ourselves. 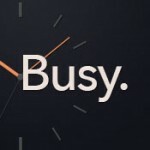 Busy means full of activity, people, work, or other things. It brings a sense of being maxed out where you feel that one more speed bump will crash you. Our lives are perfectly designed to give what we are getting. If we trust God, He has a way that will create breathing room/margin in our lives. This introductory series message begins exploring God's answer to this modern day dilemma.